*!#&@GRRR! Wreck on 75-Southbound. Wreck on 71-Southbound. Wreck on 275-East. Every path blocked! How am I going to get there? Back roads! Slower but maybe a better choice. Thank goodness for Google maps. I’m in new territory so I’ll just leave the navigation to Google. RAIN, RAIN, RAIN. Why is it whenever I am rushing there are always obstacles in my way? I can’t be late. Too much to do. Today is the day. It is the day when the women that have been entrusted to us, come with fear and in trepidation about what is next in their healing journey. Plans are ready to be put into place. Have I forgotten anything? Oh yes – pray. Off I go following the commands given to me by Google. Right, left, right, straight. Thank goodness, I have a co-pilot. I have no idea where I am. Suddenly, I see a series of arrows pointing left. I slow down. Wait, I am going right. Wait, Google said left. “Route recalculation.” Although I am balking, my car continues traveling through the fields. Did I just pass a cow? It seemed like a lifetime, but in a matter of seconds I was nose-down in a ditch. I was shaking. I roll down my window and just shake. I can’t think straight. I have always been known as an organizer and a take charge kind of woman. Where is that woman now? “Do you have AAA?” a voice said. I read the name on his shirt. Schumaker Remodeling. Schumaker, that’s a strange first name. “I called AAA and the police. I will stay with you until the police come.” Who is this good Samaritan? I read the name on his shirt again. Will I remember him? OK, now back in control, so to speak, if you can be in control and shake. The police come, and the wrecker comes. I call my husband and convince him I am OK. Am I? I am given a citation for not controlling my vehicle. It is my fault. No argument from me. I am alive. Shook, no question about it, but alive. OK, off I go. Wait, my dashboard looks like a Christmas tree. Every warning light is light up and flashing. I limp home. Home! An emotional meltdown and needed rest and reassurance. I reassess the situation. A good thing about me is that I follow through on my commitments. A bad thing about me is that I follow through on my commitments, even when it doesn’t make sense. So, what about my commitment to the women coming to the retreat? Can I get there in time? Do I have a way of getting there? Am I physically OK to lead a 4-day retreat? Can I be present and not focus on me? Affirming yes to all those questions, I am ready to go. Then I hear the voices. Hah! That last thought made me realize that this was Wormwood talking to me. He is preying on my gift of follow through with commitments. In case you don’t know Wormwood, he is a character in C.S. Lewis’ book called the Screwtape Letters. Wormwood is going to demon school under the tutelage of his Uncle Screwtape, learning how to woo souls over to his side. He was working on me to give in. A while back, I created an exercise for the Motherless Daughters Ministry called, “Writing Your Own Screwtape Letter.” I have always found it challenging to discriminate between the voice of God and spiritual attack, voices from Satan. In this exercise, women are asked to write a letter to Wormwood from Screwtape, giving him directions on how to attack me or you. One woman cautiously said to me, “I don’t want to tell Satan how to attack me.” My response was, “He already knows how to do this, but you don’t know how he does this.” Needless to say, she was blown away when she did this exercise. I have written my own Screwtape Letter. It was really hard to take a look at the ugly parts of me. What I discovered was one of my most valuable learnings. I had always thought that spiritual attack would come in a form that was negative, but not so with me. I found that my most positive assets would be used against me in the most negative way. Like my need for closure. I always have multiple balls (tasks) in the air that I am juggling. And I have the need to complete each of those balls (tasks). I can remember tasks that I did not do from a long time ago. I also treasure my relationships with my immediate family and important people in my life. Being with them, talking with them long distance, and just sharing our love are pearls for me. This is an example of where the attack comes in. Think of a juggler (me) throwing many balls in the air. Satan throws another and then another, then another, until I am frazzled trying to keep them all going and completing each one. I am so busy juggling that my relationships suffer. WHAM! He has me right where he wants me. I have learned to lay down some of the balls. I have learned to keep my relationship time sacred. I have learned that this is a form of spiritual attack. I can recognize this. The Journey Retreat took place and I witnessed many wondrous God-moments. It was just wow, wow, wow. IF I had listened to the voices, I would have missed all of those wondrous things or they may have not happened. But I didn’t listen, and they did happen. 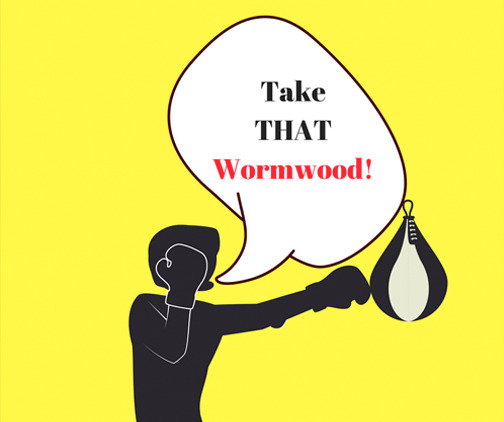 How does Wormwood attack you? What are his instructions given to him by Screwtape? Write your own Screwtape letter. Here are the instructions. Let me know you did. And if you are moved, share your letter with me. May you continue to outsmart Screwtape, I know you are listening to God. Thanks Penny. My prayer is that I am always obedient to God’s voice.